With more than 140 million copies of her books in print, Debbie Macomber is one of today's most popular authors.The #1 New York Times bestselling author is best known for her ability to create compelling characters and bring their stories to life.Drawing on her own experiences and observations, Debbie writes from the heart in this very personal devotional book, opening a window into the faith of the writer behind the stories. In her true first-person devotions, learn about how God transformed her marriage and her heart, how a Bible verse helped simplify her life, how she learned to not just pray but to listen, and how she sees God's fingerprints all over her life.Through chapters like 'Thank-You Notes to God' and 'Be a Blessing,' listeners will be encouraged to see the patterns of God's grace making their own lives beautiful. 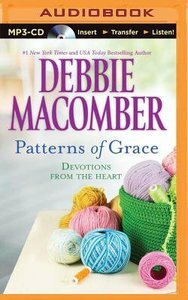 About "Patterns of Grace (Unabridged, 2 Cds)"